Flow Fit is a little bit crossword, a little bit jigsaw puzzle, and a ton of fun! Fit blocks, make words! Fancy yourself a music master? A pop-culture pro? Or an animal ace? Choose from tons of themed puzzles on your favorite topics and exercise your brain with new challenges. Flow Fit has more than 1000 themed word puzzles designed by New York Times published puzzle designers. With tons of different categories, board designs, and a variety of difficulty levels, Flow Fit provides hours of fun whether you’re a logic puzzle novice or a crossword genius! Did you know that Katy Perry has a cat named Kitty Purry? Now you do! Beat puzzles to get fun themed trivia that will make you sound like an even bigger brainiac. There’s never a dull day with Flow Fit! 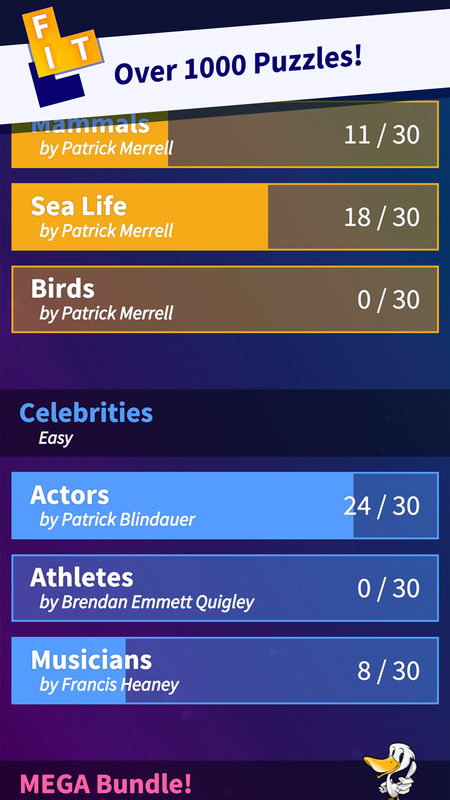 Check in every day to solve daily themed puzzles: Music Monday, Tasty Tuesday, Worldwide Wednesday, Thinker Thursday, Film Friday, Superstar Saturday, and Sunday Funday! Play something fresh every day! Put your puzzle skills to the test! What are you waiting for? Download Flow Fit today!